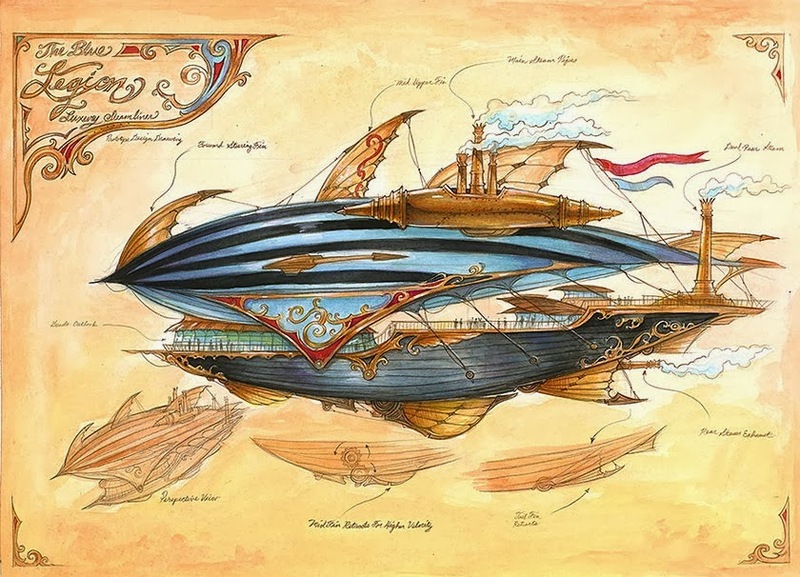 The steampunk art by Page is just beautiful. Love the artists and art work posted! Thank you sharing it! Love this! Awesome holiday art, too! One day...one day I will win. 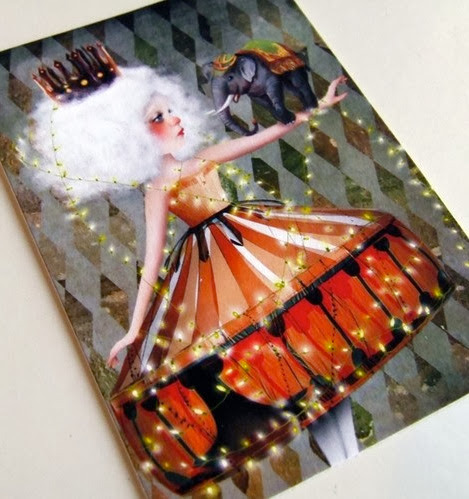 I *love* the steampunk carousel art! The seahorse is FANTASTIC! These are all beautiful! In the spirit of Christmas and not having nearly enough holiday decorations (but more than my share of nerdy ones) I would *love* a holiday print. I love all the art you share, and would love to win a piece. I like reading your blogs. They keep me entertained and I learn lots. Thanks for showcasing the art. Maybe I can win some! That star wars print is awesome ! Great picks for christmas gifts. Jennifer Nilsson's snowman is adorbs! Yay for awesome gift ideas! Oh my the starwars print MY HUSBAND WOULD LOVE ME FOREVER well I mean he already does, but even more! Please, please, please let me win. Help meh Babeh Hay-soos! I love the Mark Jason Page art! That blue squirrel just stole my heart. 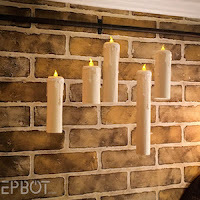 love the steampunk art, but wow is it expensive. that snowman is ADORABLE. and all the fan art i've seen for Frozen makes me want to go see it right now! I adore that Star Wars print. Sooooo cute! Love the little red bird/snowman! Oh my gosh, those airships are amazing. They remind me of the illustrations in D&D sourcebooks. :) And I love that Frozen print! I second your comments on small prints. 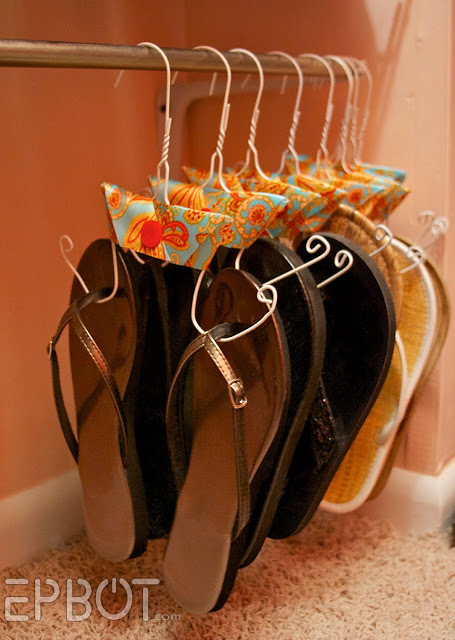 I love them, and they can go great in small groups to fill a larger space if you have it! Love love love the circus print. You always manage to find the best art! Wow.. I'd love any of them. *blinks* Pretty Please?!?! I love the art from Jessica Grundy! Thanks for sharing! They are all beautiful ... I need more wall space! So many lovely pieces! The snowman is adorable, and the steampunk works are fantastic! Oh my goodness, I love them all. The circus! The Star Wars!! The seahorse drawn carriage!!! But the blue squirrel? He has my heart! soon to have a whole new space - i could use some cuteness to perk things up! I love the art roundup! 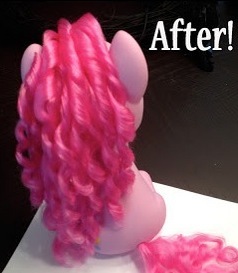 It might be my favorite Epbot feature...or the tutorials...or the con recaps...ah I love it all!! Did you see the Hogwarts print by Danny Haas? *magical dreamy sigh* Thanks for sharing the art and introducing us to new artists!! 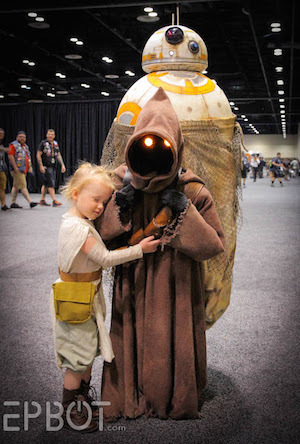 Oh dear, that Star Wars picture is going on my wish list. I must have "It's a Star Wars"! It's a awesome! Ack, can't believe I forgot to embed a link! Sorry about that - fixed now! that little blue squirrel is adorable!!!!! Love it all. Can I have the Star Wars one if I say pretty please? They are all so beautiful. I really wish that was a talent I had! Ooh! me! pick me! me! me! You always find the cutest stuff Jen. I love your art roundups every month! These are fantastic. 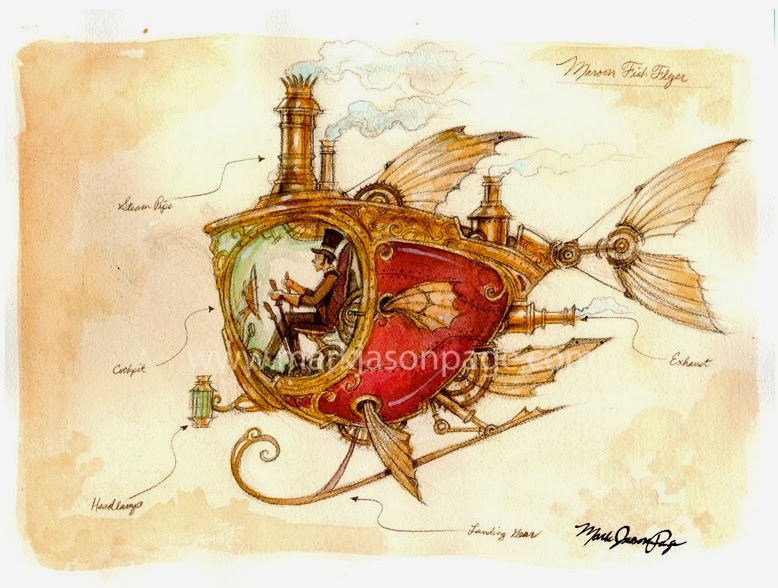 Am in such love with the steampunk goldfish flyer...so expensive though! I love these posts, such great finds and awesome art work! All of these are lovely, and I just added some to my wish lists! 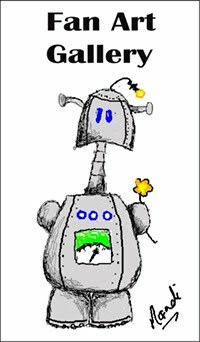 On the 12th day of December, My Epbot gave to meee...A fantastical artpiece for freeeee! So... Jen, I read all the time, but this is my first ever comment! That "small world" Star Wars print is practically perfect in every way! I love these art posts of yours. I am always finding new artists to follow. I guess it's the time of month when I stop lurking to say hi. Because I am shameless about cool free art. Hi. I love that Star Wars print! I love that little blue squirrel! Precious! 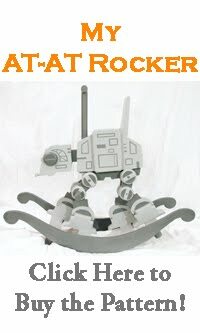 Love the Star Wars print, my hubby would love it! Thank goodness the print by Myka Jelina is still there. I am going to try again to get it. IT WILL BE MINE, OH YES, IT WILL BE MINE! I just love the red and black contrast. And have a Merry and safe Christmas. I want I want I want... everything! That steampunk art may be the best I've ever seen. Expensive, sure, but you are getting something awesome for your money. Love it all! And also need to see Frozen! The Elsa painting is gorgeous! Still haven't seen Frozen yet, but hoping to soon! I'm in love with the peppermint girl... wait, is that a song? Love the Mike and Sully print on your Pinterest page...and of course, the Star Wars one is adorbs! :) Nicole S.
All fantastic finds! I especially love the Star Wars print. I have a friend who would love it even more and I would like to give it to her! Beautiful and inspiring, as usual. 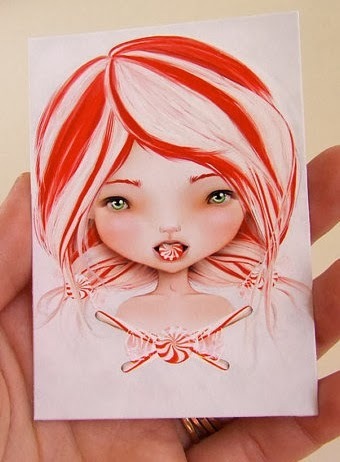 Love the peppermint girl! I will never NOT comment to win free art! The peppermint girl in the first pic was super cute, btw! I'm still crushing on those little superhero prints. I'm Gonna have to go buy that Snowman done with pencils! 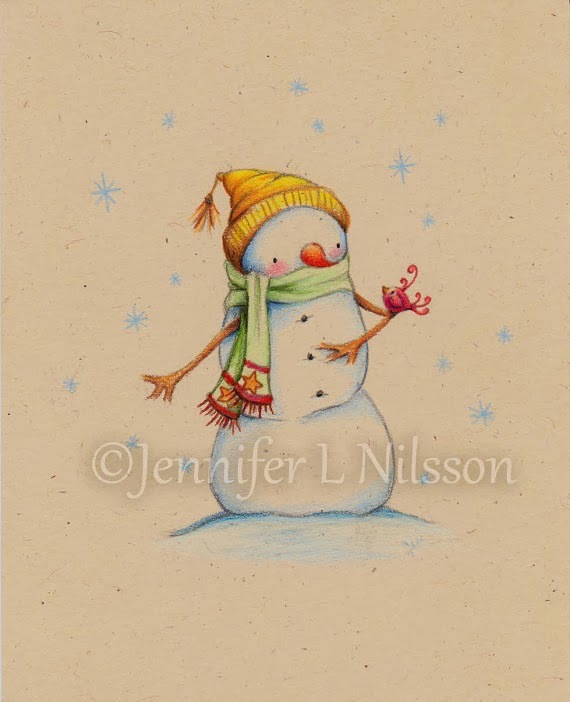 I love all things snowmen! I never thought of changing my pictures for Christmas/Halloween until i made friends with my neighbor and saw her do it, so now i am in LOVE with the idea (i have heard of people even putting that green stuff garland/Tinsil(?) on the frames they don't change around! This also is my sign up for the drawing i sooo wanna win! That Star Wars print :D I DIE! Thank you for introducing me to Jessica Grundy! You always showcase the BEST artwork! I love the "It's a Star Wars" print! So many AMAZING artists! I must say my favorites are the Star Wars/Small World mash-up & the Frozen print! Thanks for sharing! Love so many of these! Oh I love that steampunk art!! So pretty!! 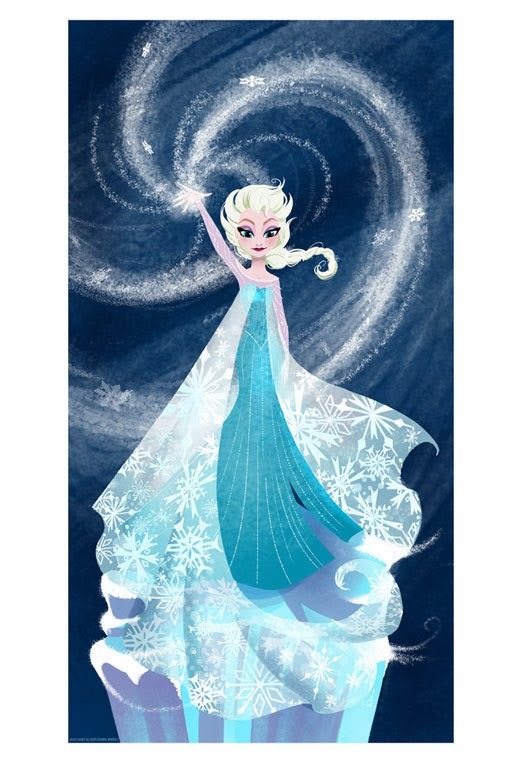 Good gravies I love the Let It Go art. I love Frozen. I like to think that Elsa is fighting a panic/depressive disorder. But maybe that's me projecting. Little red bird is adorable! Love all of the winter/Christmas (and Nightmare Before) prints! You find just THE COOLEST artists, whether they are my style or not. The sea horse is to die for...or at least comment for. Now you have me all inspired to get back to shopping...er...work. I'd like to win! Beautiful finds, as always....and BTW, Frozen was GREAT! Love them all! Especially the star wars one! I love all the artwork you find, so awesome! Oh, I would so love the little bitty Batman and Batgirl! I'd love to win a piece; you're so awesome for sharing the neat art finds with all of us, and for giving some away to boot! Thank you Jen for making my geeky day! Poor college student trying to scrape together enough money to buy my brother a Christmas present since I can't fly home to visit him and his wife - I know he would love one of these pieces! I. Am. In. Love. I'm almost mad at you for introducing me to Danny Haas now because I'm going to cry myself to sleep tonight because I have to spend my money on textbooks instead of all his art :D. Oh and I'm still pining for that Iocane Powder print that I can't get anywhere other than from you! Thank you so much Jen, you're such a wonderful person/blogger. Ha! Well, I'm ok with that kind anger, then. :) And whaddaya mean you can't get the Iocane print? 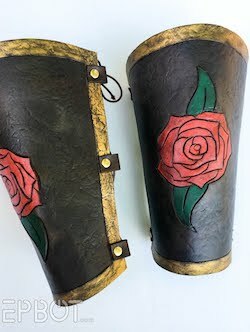 It's right here on Etsy, and he ships worldwide! Loving the selection this month! The little blue chipmunk absolutely slays me. love the things you pick to share with us! I love the steampunk art and the blue squirrel made me squeal. Love it! Thanks for sharing all this wonderful art. Wow. I could spend a fortune on Danny's work!!! Now to find places for it all so that I CAN spend a fortune on it. Wonderful eye candy! I think the Star Wars print and the fish-copter are my favorites. So great! Pick me! I love all the art you post. I looked on your printrest giveaway board and found that there are many amazing pieces already gone. I would love to win "Man of Steel" by Alex Asfour for my husband for christmas. He is a superman fan - no matter what version. I hardly ever post but I felt like saying I just love this blog, Jen and John and all the fantastic people that follow it! I always feel like I'm at home here, I always learn some cool stuff, find people that I feel like I could be great friends with (even if I AM too chicken to say hello lol!) and on posts such as this I find some great new artwork for the walls! Please keep up the great job! 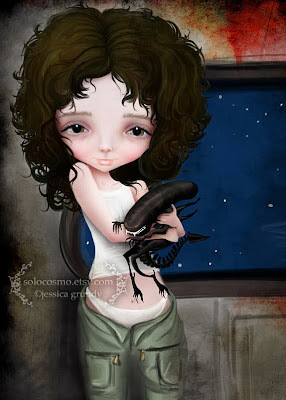 Wow that alien really is cute! On a more serious note, that Merida piece is gorgeous and I will love you forever if you would be so kind as to pick me so I can have it. As an archer myself I'm particularly fond of the wee Scottish lassie. I love these art round ups - so inspiring! That Star Wars poster is adorable. I love your art roundups and this giveaway! I would love to have the Monsters University artwork to really start my art collection. Thanks for the opportunity to win! 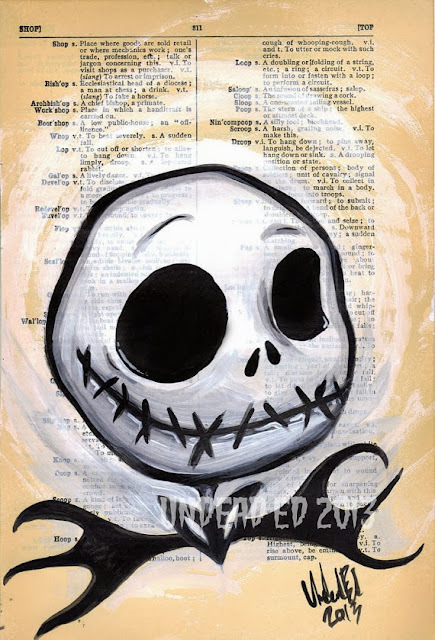 My friend would love the Jack Skellington for X-MAS!!!! Love the circus print and of course Danny's Star Wars print. They'd make excellent additions to my new house! All the art that you pick is just so fabulous! I love your art roundups and introducing us to these great artists! Hmm Merida would be lovely! 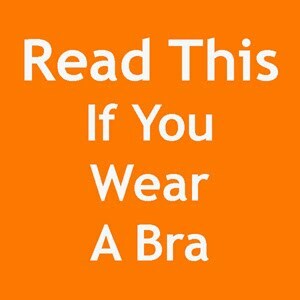 ;-) You're so great for doing this, btw. Heck yes I want to win that Star Wars print for my almost three year old's room. It would go great with the plush Enterprise and Vader wearing a Santa hat he's getting for Christmas. Funny story - my mom called to make sure Veggie Tales wasn't going to freak my son out when he spent the night. My reply? "Mom, he saw the final fight scene in the new Star Trek movie and thought it was awesome." I'm dying to get my own Jack Head and may or may not proceed directly to order myself one. 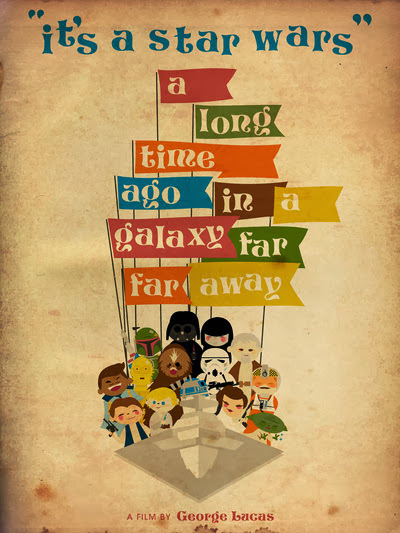 I would absolutely love love love to win the Star Wars/Small World Print. Not for me, but for my friend Brenda who loves Star Wars and was completely crushed that Small World was closed while we were there on our Epic Grown Up Disney Vacation last year (co-incidentally, the same week they announced the Disney/Star Wars acquisition). This is perfect and a perfect reminder of our trip together. Jen, you always show us great art pieces - and you've really broadened my horizons, art and otherwise! My favorites are "It's a Star Wars" and "The Little Red Bird". That snowman is freakin' adorable! I hope you pick my name! Love the art! I'll be moving somewhere larger soon (ish . 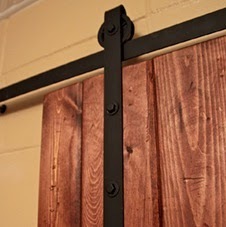 . .) and will need to populate my walls! I love that small angel sketch/painting! Beautiful. You are always so good at choosing art! I love your holiday selections. 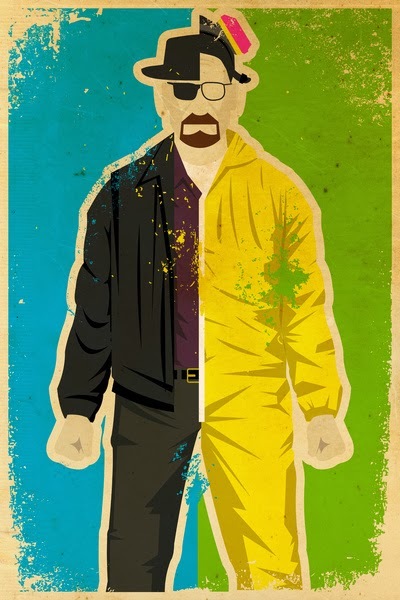 I love Danny Haas' artwork! I'm probably not the first person to say this, but you should definitely see Frozen. It's cute (with a few darker moments, yes), and beautiful (oh, those snowflakes and the ice! ), and the story is one of the best I've seen Disney do. I love your art round ups! We just moved, though, so I'm still trying to decide where to put all our existing art. so many empty walls! Always look forward to your art roundups, Jen! Darn it, Jen, that fox is so dang cute that you got! 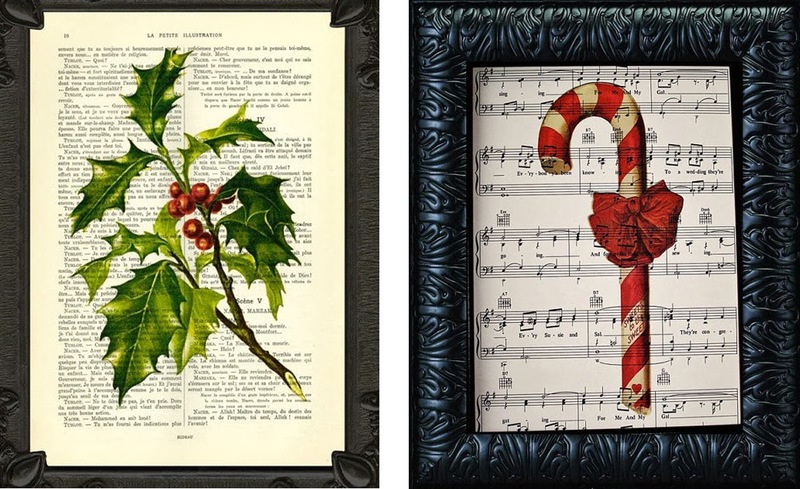 I think I'm going to have to splurge on some new Christmas art from that etsy store. I'm so tired of the Christmas decorations I have right now, I might have to get a few and make a little collage out of them or something. And I love that Frozen art! You have to go see the movie! Best Disney movie in ages! I have loved that Star Wars print from the first time I saw it in Pintrest a while back! I LOVE all the geeky art you find! This month's featured art is so inspiring! I think I'll go shopping today and see what I can find for my girls. They walls in their room could be more filled. You find the most amazing art and artists! 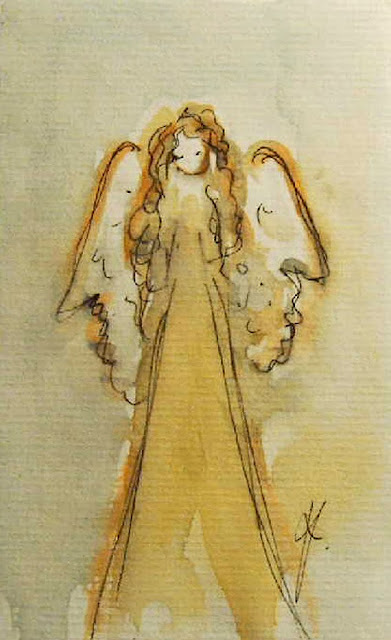 I'm charmed by that watercolor angel. I'm so behind on Christmas decorating! I have a 10yr nephew who talked my sister into making an Ewok costume. Not just any Ewok, Captain Chirpa. So this would ROCK his world if his aunt won this so his brother's hockey posters could get moved over....please???? Those are all gorgeous! 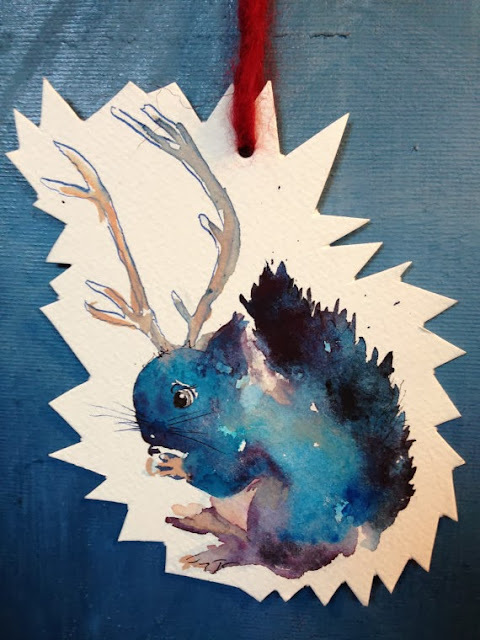 I have a soft spot for watercolors, so my fave is the squirrel ornament (but you have to say it like Veruca Salt - "Skwirrr-el"
I love when you share your art finds! I just bought three James Hance pieces (and just saw another I will HAVE to have). I would love to add to my collection with one of your pieces. Thank you for sharing. 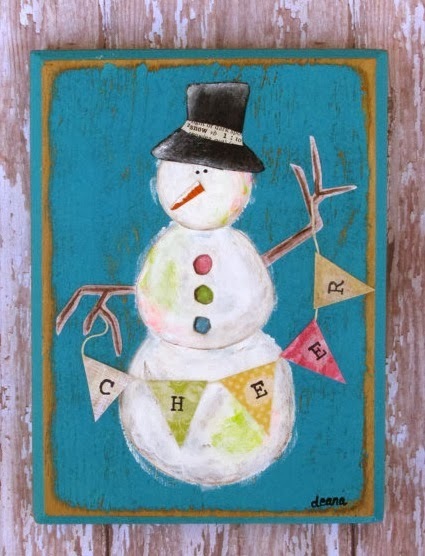 The mixed media snowman makes my heart melt :) Thank you for sharing! These are really beautiful. I wish the things I see in my head would translate to drawings and paintings like these, but I definitely do not have the talent to make such beautiful images. 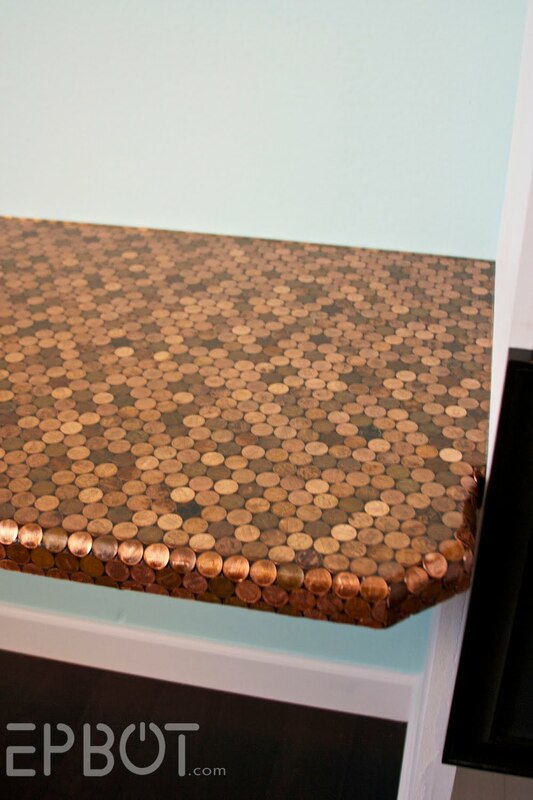 Thank you for sharing all these great finds! I have found a lot of wonderful Christmas and winter prints at my local thrift stores. Also, I would love to own a copy of the Star Wars/Small World mash-up! Gosh, I love all the Katie Cook work on the board! As a former Disneyland Small World Cast Member and huge Star Wars fan, I'm pretty sure I need that print. Now I'll be humming "It's a star wars after all, it's a star wars after all, it's a star wars after all, it's a star, star wars!" all afternoon...darn it. LOVE the Small World Star Wars! Guess with IGoogle gone I'm not a person any more. It's meeee - Kimberly Cook, entering the contest. I keep dreaming of a Pocket Princess but the Star Wars world it's beautiful! I can't his site from work but I'll check back at home. Cheers! Awesome stuff! That Elsa is really beautiful. Reading your blog has inspired me to get back into creating. Thanks for being so awesome and I hope you're still enjoying your mini-you(from Supercon 2012). As usual, you've given me more reasons to slack off at work. it's all very inspirational. makes me want to get out the art pencils and be creative. I didn't even have to read your comment to know you liked that steamy seahorse. Been reading your blogs for far too long now. (that tiny blue squirrel has stolen my heart.) Hmm, I'm going to go with "Tea Time With Wampa." It's cold enough here in Indiana that I'm tempted to cut open a tauntaun and climb inside, but this painting warms the cockles of my heart! Hoping to get some lovely gifts. You always have such a great eye for art! Even if your taste is different than mine, I always like to see what you choose to feature. Today hasn't been very good for me, and I really like being able to come to your blog and ooooh and aaaah at some art. Thank you. I would absolutely love that "It's a Star Wars" poster. For as much of a SW fanatic I was growing up (and still am! ), I actually had not ever seen it before, but think it's amazeballs. And this girl is in need of some more happy-face-making stuff. Just so you know, I don't comment on here much, but have been lurking for a few years now, and your art roundups have *always* put me in a better mood, even when I was in the deepest of the worst of the darkest depths of dissertation-instigated depressiveness. 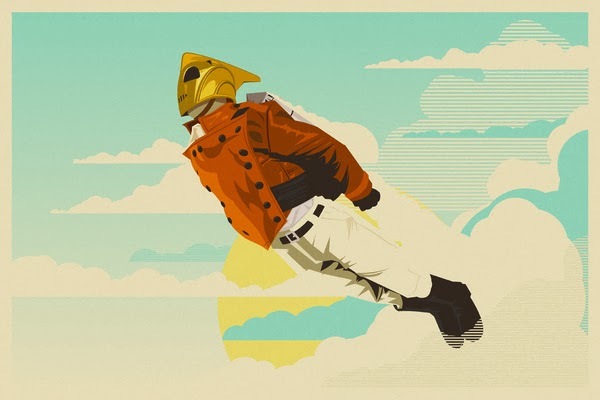 As a matter of fact, there was one roundup in particular I remember from last fall, because you featured a fabulous Steampunk Bobafet done Art Deco style print, and I bought one so fast I almost didn't know what happened. Those were dark days for me, but seeing/clicking/buying--> receiving that poster was a definite bright spot, thanks to you. Ok, enough of the sad timez. I just felt like I needed to say a bit more than just a plea for a gift when I've not really been a regular (visible) presence. Just know there are those of us who admire your nerdiness, bravery, and feel a kinship even though we're out here hiding behind our keyboards. Because of.... reasons. I have a love/hate relationship with these posts. I love them all and hate that I can't buy every single one. I'm running out of wall space. As always, would love to be selected!! 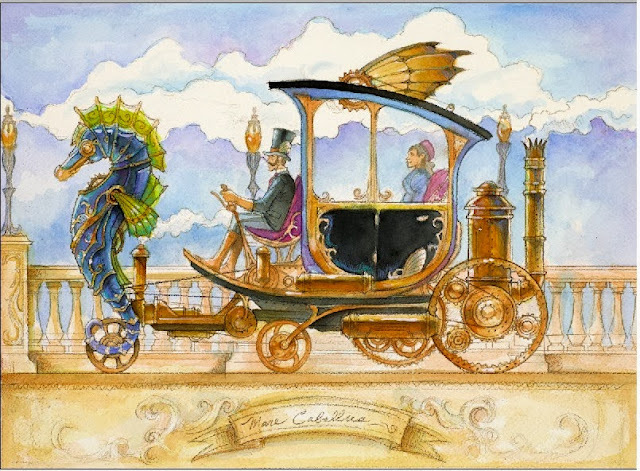 I'm definitely interested in the steampunk watercolors...going to have to check more of those out for myself! LOVE the Jack Skellington!! One of my all time favorite movies! Jen, I swore I wasn't getting anything more from Etsy for Christmas! You are breaking my resolve. I would love to win either the Merida or the Link one! The first two are absolutely gorgeous! Love them!